Let's take a trip to see Farmer MacDonald! 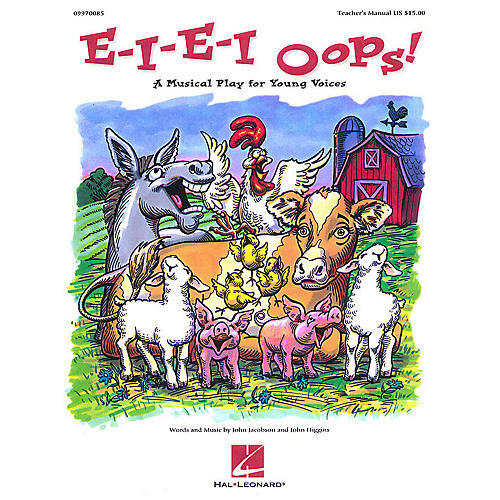 The whole barnyard is singin'... rooster's singin' tenor, the mule chimes in on bass, the chicks are pretty good altos, and the sheep are all over the place! But wait! Something's wrong with Madame Cow... she just can't moo! Join the fun as the animals all do their part to save the day! This clever, original 20-minute musical features 5 songs in a variety of styles with easy-to-learn rhyming dialog. Available: Teacher's Manual, Singer's Edition 5-Pak, Reproducible Pak (vocal lines, lyric sheets and dialog), Preview CD (Full Performance), Performance/Accompaniment CD. Performance Time: 20 minutes. For Grades K-4.